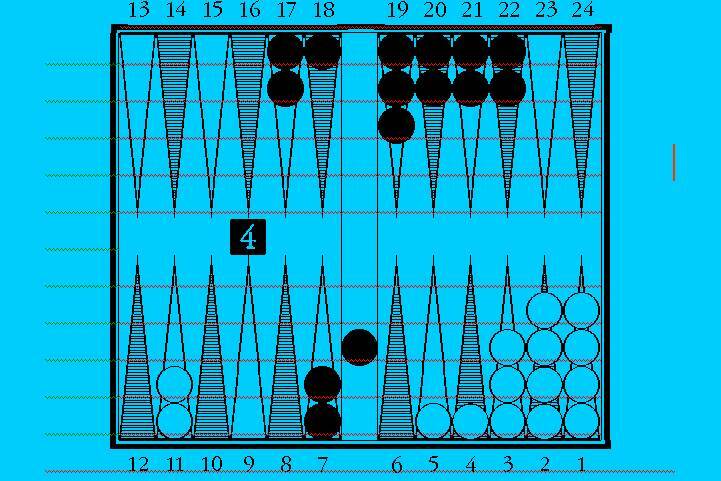 January of 1996 saw the first Pattaya Open backgammon tournament. In the Januarys since it has been the Thai Open, and I’ve been back every year to defend my title. 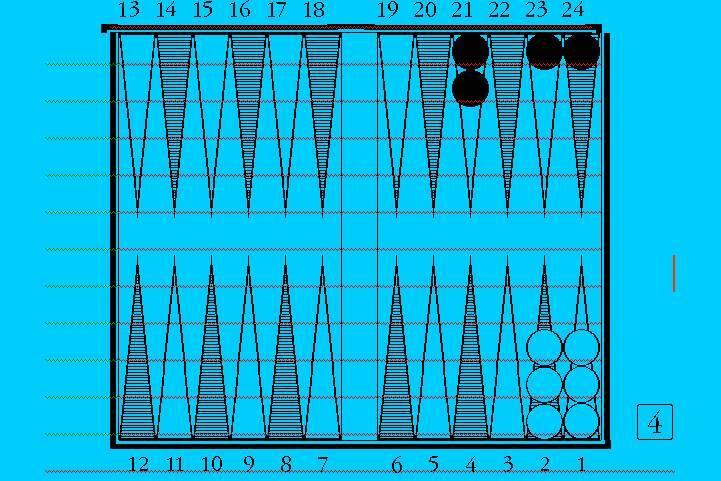 The Pattaya Open kicked off one of my best years in backgammon. After winning it I won, among many other money finishes, two of the most prestigious events on the tour, the Midwest Championships, and the U.S. Open. I also published my first book, Can a Fish Taste Twice as Good? "5 baht!" She held out her hand and I handed over a 5 baht coin. "Now what?" I asked. Noi began tossing dice and flipping clappers. "5 baht!" Her hand was out again. I might not be good at this game, but at least I was consistent. We were painting the town red, Andy, Marty, and I. Earlier that evening I had won the Pattaya International Open Backgammon Championship, and it was time to celebrate. We had wandered into the Friendship Bar, and were making friends. In is not quite right. The Friendship Bar has no walls, and is not really one bar, it’s more like fifteen bars. The Friendship is a slab of concrete, and a roof. Under that roof are a bunch of small, square bars, numbered 1-15 for easy reference, and a couple of boxing rings so that one can watch live mayhem from every direction, and not have to turn around and possibly fall off a bar stool (Later that night somebody did fall off a bar stool and drew a bigger crowd than the fights had). With so many bars, competition for customers is fierce. Besides the usual lures - beautiful bar maids, 15 foot pythons, panhandling elephants - most kept a supply of games to help everyone get acquainted. Games! I was the reigning Pattaya backgammon champ, Marty is one of the top gamblers in Asia, and Andy, like Marty, is originally from New York. New Yorkers may be confused about many things - what constitutes good pizza springs to mind - but they are above average game players. Little did these girls know they were playing with hustlers. Soon, I was sure, we would be the game playing kings of the bar; Lords of the Lounge as it were. "So, you flipped over all those thingies, what's that mean?" "5 baht!" It was good to get such direct answers, it speeds the learning process. Meanwhile, I didn't let on to her that she was playing a champion anything. I didn't want to scare her off before I started winning. Money game. Should White redouble? This position arose one afternoon on the beach during a high-stakes joust among the Swedish contingent. It was shown to me by Joachim Johansson, who had redoubled Lars to 8, had to eat a 16 cube, but swallowed it just fine, thanks, after Lars threw a repeat 1. I thought, bleary eyed though I was (my training regimen involved staying out all night, and downing lots of Singha beer, which I had been told was rich in carbohydrates), that whoever owned the cube was the favorite. I so opined loudly enough to draw a challenge on the field of honor from Vichai Kwatra, one of Bangkok’s top players, and the first Thai player to hook up to FIBS (VC on FIBS). Vichai had correctly calculated that White was, cubeless, a significant favorite, but having worked on a lot of these problems, I was able to factor in the cube, in my head. So long as rounding errors, or carbohydrate poisoning, didn't lead me astray, I was sure I had a small edge. Various others including Andy Krenitz, Joachim, and Thomas Ribohn (my Semi Final opponent) jumped in and out of both sides of the prop. We were playing sets of ten, and I went 9 of ten the last round to net a few points. It turns out Black wins 50.5% when owning the cube, and has an edge of about 4.5%. "5 baht!" Noi snapped my attention back to the game at hand. I hadn't won a game yet. Of course, I still didn't understand the rules. Andy, at least, knew how to play his game. It was called "Connect 4", and was sort of like a large tic tac toe played by dropping slugs into a plastic frame. The object was to get 4 in a row, and Andy was making progress; he was getting as many as 3 in a row almost every other game. Marty was suffering too much to play his game - Jenga. He was recovering from an attack of gout, and from an elephant I had talked him into riding. Car sick and sea sick I had heard of, but who knew you could get elephant sick? Instead of playing games, he was teaching his waitress the four English phrases essential for success in her chosen profession: "Hello", “What's you're name? ", "Where do you come from? ", and "Buy me drink!" For the sake of logical consistency, if she repeated the last properly, he was obliged to buy her a drink. Like all good students, she realized that, onerous though it might be, the only way to master a new language was to drill. Marty was buying her her sixth drink in half an hour. 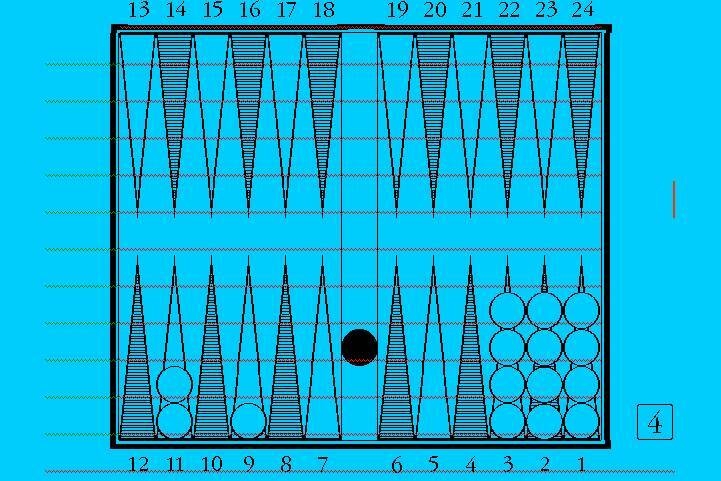 The game Noi was teaching me is called "Clapper". It is played by throwing two dice into a wooden box, then flipping over clappers numbered 1-9 when one or both dice match the number on a clapper. "When you flip them all over, you win?" "Yes. 5 baht!" the hand was out. "What about this time? You don't match, so you can't flip the last one?" "I flip for you! You lose! 5 baht!" "This is fun! Would you like another drink? Oh, oh! I'm out of 5 baht coins. Now what?" High stakes couldn't scare me. This was from the 200 baht chouette. Money game. Black redoubles. Should White take? want to take it either, but I suspected I could win this one way too much to pass. Just for starters, Black dances 25%. Sometimes he comes in without hitting, and sometimes I win after he hits. Sure, I could get gammoned, vaporizing most of the points I spent the day winning, but Black still has two open points, and may not be able to get a second man. JellyFish™ puts this at -.457 on a one cube, so the take is pretty clear. But uuuugly! It was an exciting last game. They closed out 4 of my men. I hit their 15th checker from the bar to temporarily save the triple. We reached this position, then they rolled 66. Then I did, too. The next day I became the first player among the six of us to realize our 43 had not been forced, and we had left an unnecessary double shot! Next year's tournament will be in January. Mark your calendars. Thailand is not for everyone, but there are many reasons to consider going. 1. Thailand is a beautiful country, with friendly people, and plenty of touristy things to do. 2. If you are tired of every tournament looking just like every other tournament, believe me, this one will look different! Thailand is even more exotic than Indianapolis. 3. Thailand is cheap. Okay, the airfare is expensive - about $1000.00 from the U.S. - but hotels, meals, shopping, can be real bargains. If you want 5 star hotels, they are available, but for $30.00 per night I had a large and comfortable room at the Diana Inn. 4. The prize money should be pretty respectable. Goran says he hopes for 32 in the Open at $200.00-$250.00. I am predicting over 40 (and possibly a $300.00 entry). With calcutta, this adds up to a fair chunk of change. 5. Goran is hoping to tie in a golf tournament for interested parties. 6. Goran has invited me to give a talk. I don't know if that last one will lure people, or horrify them. I have always considered myself a man of few words, sort of the Gary Cooper of backgammon, but I've got a whole year to think of something to say. So I'll be back there. Besides, Noi and I are up to 20 baht. She says she's never seen anyone progress so fast!